Multi-residue methods permitting the high-throughput and affordable simultaneous determination of an extended range of endocrine disrupting chemicals (EDCs) with reduced time and cost of analysis is of prime interest in order to characterize a whole set of bioactive compounds. Such a method based on UHPLC-MS/MS measurement and dedicated to 13 estrogenic EDCs was developed and applied to biological matrices. Two molecular recognition-based strategies, either molecular imprinted polymer (MIP) with phenolic template or estrogen receptors (ERα) immobilized on a sorbent, were assessed in terms of recovery and purification efficiency. Both approaches demonstrated their suitability to measure ultra-trace levels of estrogenic EDCs in aqueous samples. Applicability of the MIP procedure to urine and serum samples has also been demonstrated. The online version of this article (doi: 10.1007/s00216-015-9024-4) contains supplementary material, which is available to authorized users. 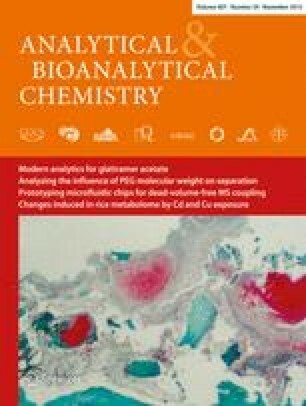 The authors want to express their special thanks to all the volunteers who have permitted the collection of biological samples exploited in this work. They also thank the Centre Hospitalier Universitaire de Toulouse as the promoter of the corresponding clinical protocol.